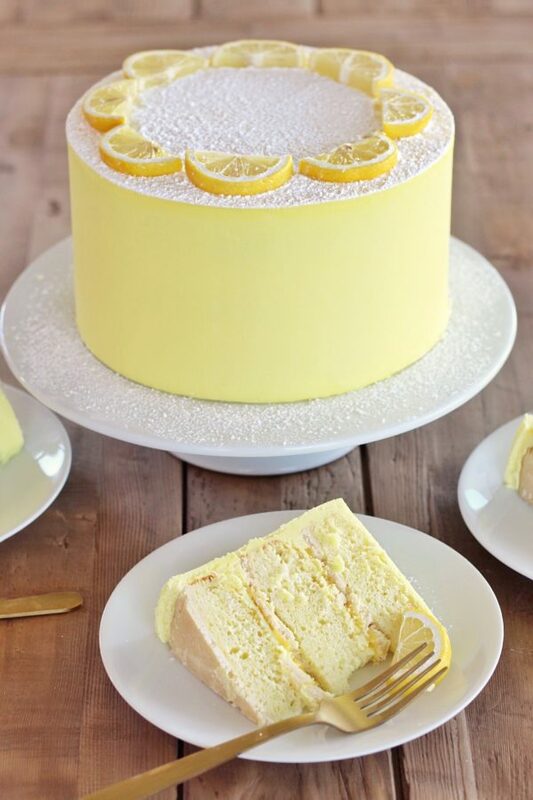 Lemon Bar Cake – lemon cake layers baked on a shortbread crust, filled with lemon curd and topped with a lemon buttercream. This winter is proving to be a long one and even though spring is supposed to officially start in just a couple weeks, I’m doubtful it will really come. We’ve had so much snow and so many freezing cold days this winter. And just when you think it’s over with the arrival of blue skies and 55 degree weather, winter comes back with a vengeance. It hit hard again last week for a couple days and I couldn’t help but dream of springtime… and spring baking. Flavor combinations started flooding my head and the one that seemed most appropriate was a cake inspired by lemon bars. Why lemon bars, you ask? Well, this past weekend was my mom’s 60th birthday and she’s a huge fan of lemon bars. She actually makes the most delicious lemon bars and I’ve been eager to get another lemon cake recipe on the blog for a while. It seemed like the perfect inspiration for a new cake. Plus, a few months ago, my brothers, sister and I decided to surprise my mom with US for her birthday! Yup, the four of us together would be our big gift to her. But I didn’t want to show up empty handed, and we all know that every birthday needs a cake… so, it was the perfect time to try out this new recipe. 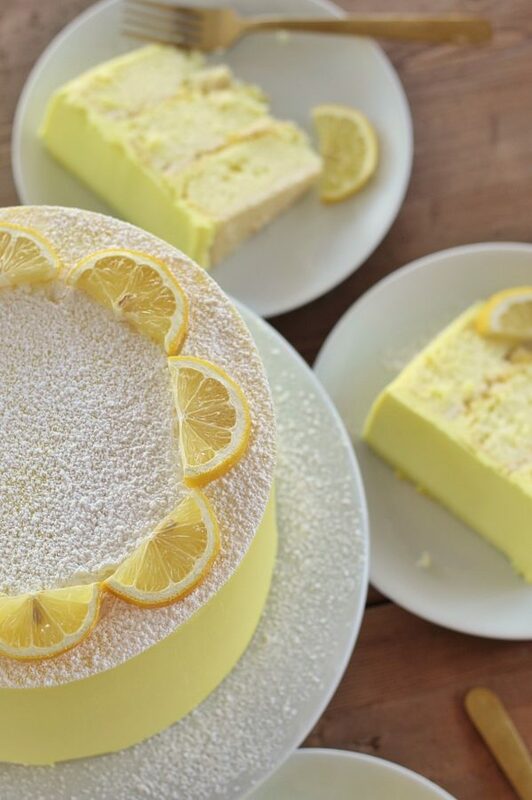 This cake has all the makings of a lemon bar, but in cake form, of course. I started with a shortbread crust that you’ll bake on it’s own for about 8 minutes. I then added a lemon cake on top of the crust. 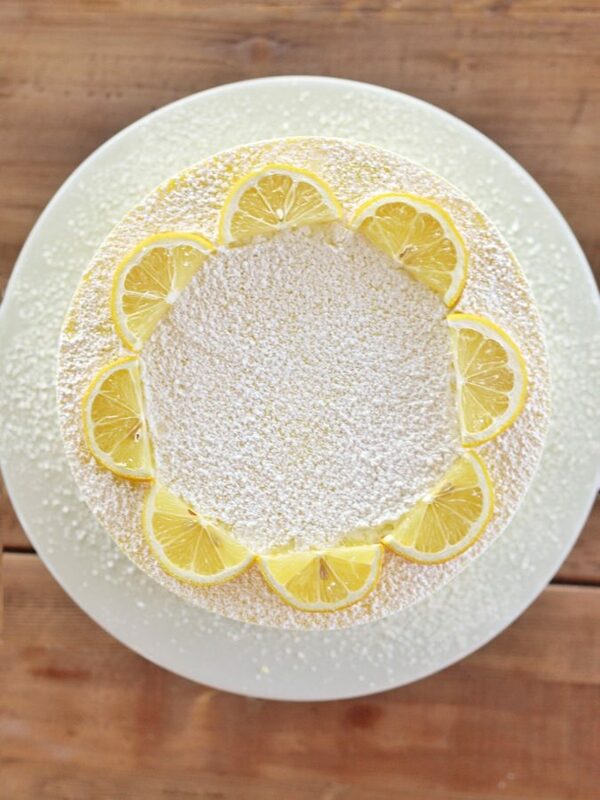 This lemon cake is so divine and would be equally delicious without the crust if you wanted to just have a basic lemon cake. I’ve filled the inside with a lemon curd and lemon buttercream. I realize that sounds like a lot of lemon, but trust me, it all blends so beautifully that it doesn’t feel over powdering. Plus, the savory shortbread crust is the perfect contrast to the tartness and sweetness of the rest of the cake. I was able to share this cake with friends and family and it’s been a hit all around! Make the lemon curd a few days in advance. Make sure not to put too much curd in between the layers so it doesn’t lose stability. Instead, use only about 1/4 to 1/3 cup curd in the cake and serve extra on the side of each slice. Make sure to use a sharp knife to cut the cake. 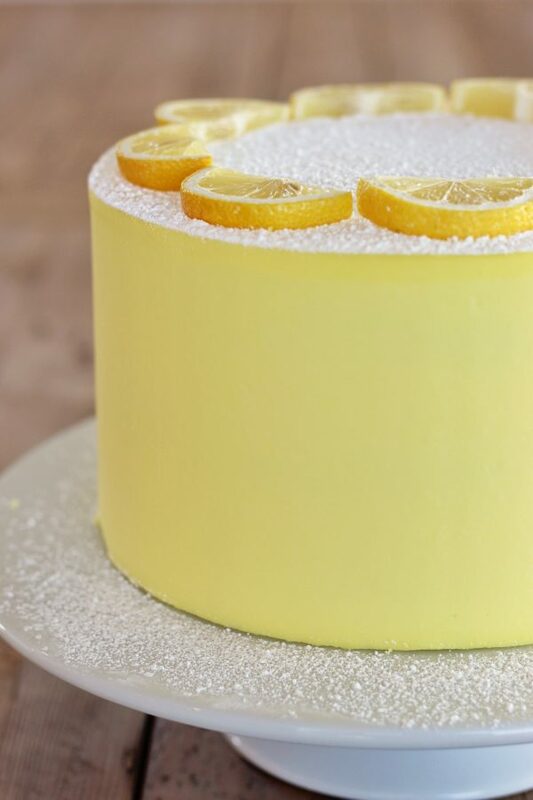 Lemon cake layers baked on a shortbread crust, with lemon curd filing and lemon buttercream. Preheat the oven to 325 degrees F. Spray three 8-inch round cake pans with nonstick spray, line each pan with parchment and spray again. Set aside. Evenly divide the shortbread cookie crumbs into each cake pan (about 8 ounces each). Using the back of a spoon, press the shortbread cookie crumbs into an even layer on the bottom of the pan. Bake for about 8 minutes. Let cool while you make the cake batter. In a medium size bowl, whisk the egg whites and add the lemon extract. In a bowl of an electric mixer fitted with a paddle attachment, combine the dry ingredients together on low speed for 30 seconds. Add the butter and continue to mix on low speed until the mixture blended. Slowly add the buttermilk and mix on low speed for a couple minutes. Scrape down the sides of the bowl and begin to add the egg mixture in 3 separate batches, mixing until well combined, about two minutes. Scrape down the sides and bottom of the bowl to ensure all the batter has been incorporated. Divide batter evenly among your pans, right on top of the shortbread crust, about 16 oz of batter in each pan. Bake the cakes (on the shortbread crust) until a toothpick comes out with a few crumbs inserted into the center, about 22 to 25 minutes. Let cool on wire racks for 10 minutes before inverting them onto cooling racks to cool completely. The cake will stick to the shortbread crust and flip out of the pan together. Whisk the sugar, lemon zest, and lemon juice in a medium saucepan. Whisk in the whole eggs and yolks in a small bowl and then whisk them into the lemon mixture. Cook the mixture over medium-low heat, whisking constantly, until it's thick like pudding, about 6 to 8 minutes. Remove from the heat and whisk in the butter a few pieces at a time until incorporated. Strain the mixture through a fine-mesh sieve into a small bowl, pushing it through with a rubber spatula. Press plastic wrap directly onto the surface to prevent a skin from forming. Refrigerate until completely set, at least 4 hours and up to 5 days. In the bowl of a stand mixer fitted with the paddle attachment, beat the butter until light and fluffy, about 2 minutes. Turn the mixer to low and gradually add the powdered sugar, followed by the cream, salt and lemon extract. Mix until combined. Add food gel, if using. Mix until incorporated completely. Turn the mixer to medium-high and beat the frosting for about 5 minutes. Remove bowl from the mixer stand and use a wooden spoon to beat the frosting by hand for about 2 minutes to push out any air pockets. Spread a small dollop of frosting onto a cake board. Place the first layer of cake, top side up, on the board. Spread a thin layer of frosting over the cake layer and pipe a rim of frosting around the edge of the cake to create a barrier to the filling. Spread half of the curd in the center of the cake, carefully spreading it to the edge of the piping. Place a second cake layer on top of the piped frosting and filling and repeat step 2. Place the final cake layer, top side up, on the second layer of filling. Lightly coat the cake with a thin layer of frosting to lock in the crumbs. Freeze the cake for about 10 to 15 minutes to set the frosting. Finish frosting and decorating the cake with the remaining frosting. The cake can be stored in the freezer for about a week, in an airtight container. Give the cake about 8 hours to return to room temperature before serving. Can’t wait to try this! I’m assuming that you pour the batter on top of the previously baked shortbread layer? Not to be dumb but I wasn’t clear on this part. 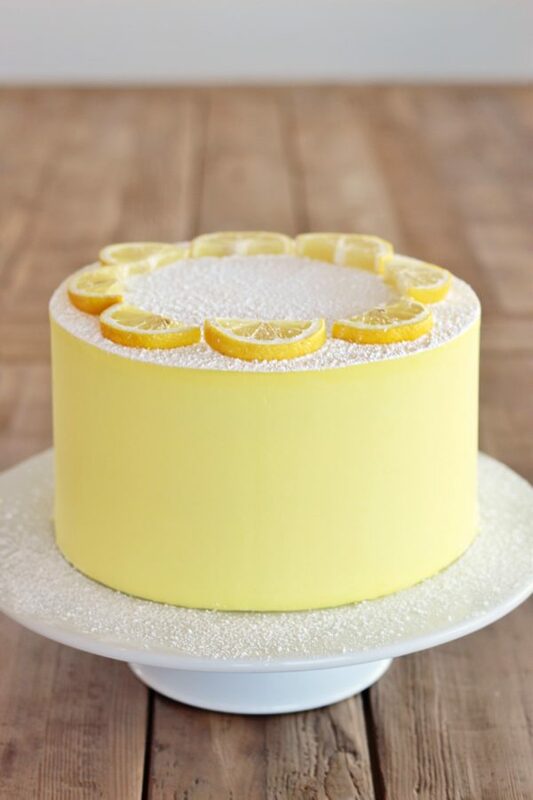 I can’t wait to try this cake because I love lemon anything! When you cook the shortbread for 8 minutes, do you add the cake batter on top and cook it until the cake is done or do you crumble the shortbread after the thin layer of frosting and adding the curd? Thank you! You cook the cake batter on top of the shortbread crust. This looks delicious! I’m a little confused though as to where you combine the shortbread and the cake layers – do you bake the cake on top of the shortbread after it’s had its initial 8 minute bake or are you stacking both elements (fully baked) as you build your cake? Make and bake the crust first and leave it in the pan. Put the batter on top of that and bake as usual. I’ve not tried this recipe, but a similar one (cookie cake, 5 stars) and OH MY GOSH. The contrast in textures compliment each other perfectly. Hi! Can I use 3 6 in pans for this recipe? Looks good, and I’ll have to try! Any ideas for an egg-free lemon curd? Or a substitute for that? Also, your instructions on assembly don’t include the shortbread crust. Do you put a layer of frosting between the shortbread and the cake layer? Or does it stick on its own? Excited to try! The cake batter gets baked on the shortbread crust. Looks delicious! How much salt do you put in the lemon curd? I see it in the instructions but not the ingredient list. Sorry about that – just a pinch. Does the shortbread crust just go on the bottom? Yes, bake the crust and then pour the batter on it and bake again. When you do step 2 for the cake and you are whisking the egg whites and the lemon zest are you just combining them? Or are you whisking them to form peaks? 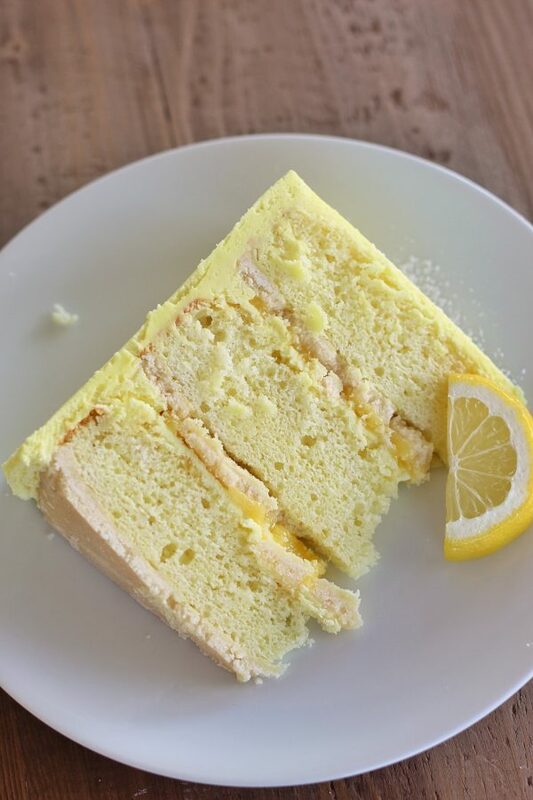 I know you are a cake blog…but any way you would post your Moms lemon bar recipe? This cake looks awesome! Instant or Cook and Serve pudding? Can you tell me what pudding mix is? I live in Europe so trying to find an alternative. It’s a small box of powder that gets mixed with milk to make pudding. I put 2 cups of batter of this recipe in 6 in pans and they didn’t rise that much and didn’t measure up to 2 in. Is there any way to fix the problem? I was really looking forward to this but the cake itself barely rose at all and the taste is rather bland. I’m sure the lemon gets punched up beautifully with the curd and the frosting but on its own, it’s a little disappointing. Hi Nell. Sorry to hear you had problems with the cake. It actually should rise nicely. Have you checked your baking powder lately? If that’s old, the cake won’t rise well. Also, if you overmix your batter, the cake won’t rise well either. 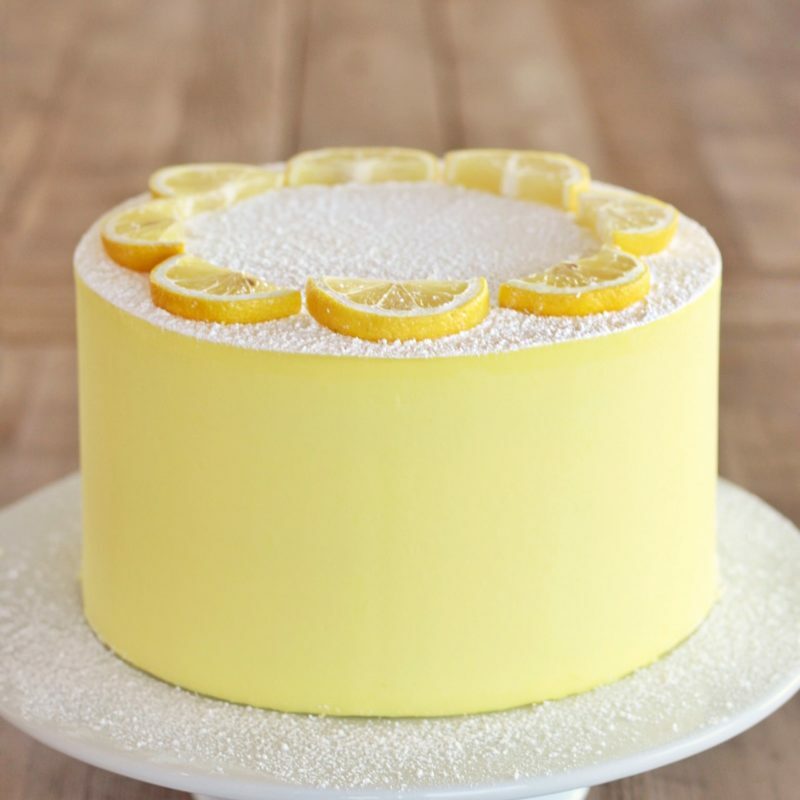 As for the flavor, since I did pair it with the lemon curd and lemon frosting, I didn’t want the cake to compete or overload you with lemon since the lemon flavor is so strong elsewhere. If you add another teaspoon of lemon extract, it will give you a little more punch. Can the recipe be halved and used with 6in pans? Yes I think you could cover it. Should the salt for the cookie layer be added in with the sugar & butter or when the flour is added?